During a lifetime, a person sees hundreds of thousands of faces. Of course, you wont remember all of them, in fact you might find you’re embarrassed when you fail to recognize a distant relative at a family gathering. Things like this happen, but you shouldn’t be upset on your brain. In fact, it does a pretty fantastic job considering it needs to process distinct and subtle cues every time you see a face. How and where does this process take place in the brain, however? A latest study from Harvard psychologists suggests that face processing is a standalone mechanism, separate from object processing. Some scientists argue that face processing relies on the same brain mechanisms used in other areas of visual expertise, like the same we use to recognize a cup or various animals. To test this hypothesis, Harvard and Dartmouth researchers made tests with patients suffering from prosopagnosia also known as “face blidness”. People with this condition can see the eyes, the nose, and the mouth, what is known as the context – but they cannot see them as a whole. They do not recognise gestures or emotions. Until recently, it was thought that very few people suffer from prosopagnosia. The condition has traditionally been studied in individuals who acquire the disorder following neurological damage (typically from stroke or head injury), and a handful of case studies were reported in the literature in the 20th century. However, it has recently become clear that many more people suffer from prosopagnosia without experiencing neurological damage. This form of the disorder is commonly referred to as “developmental” or “congenital” prosopagnosia, and these individuals simply fail to develop normal face processing abilities despite normal intellectual and perceptual functions. Developmental prosopagnosics have suffered from the face recognition impairment for most of their lives, perhaps since birth. 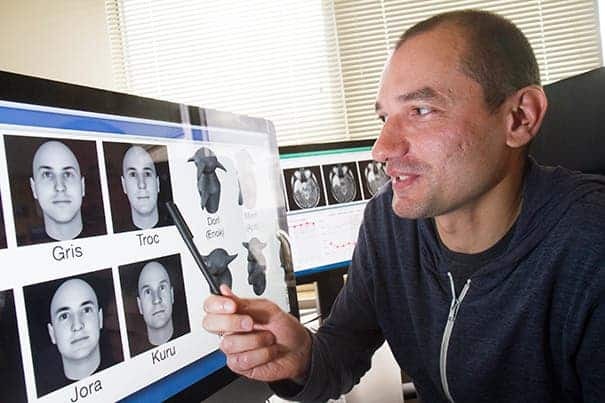 Recent evidence suggests there may be a genetic contribution to developmental prosopagnosia, and several case studies report at least one first-degree relative who also suffers from the face recognition impairment. Clearly, prosopagnosia patients are unable to recognize faces, but the present research sought to find out something different. The researchers asked the volunteers to distinguish between 20 computer-generated objects designed to engage the brain in the ways faces do. Commonly used in psychological research, these sort of objects are called greebles. These can be grouped into families based on their body types, and share a limited amount of common features – in a sense they’re the same, but different if you catch the subtle markings. So in a way, to sort between the greebles, the participants had to recognize these subtle differences much in the same way a normal person distinguishes specific face features. Even normal people that don’t suffer from prosopagnosia have a tough time distinguishing greebles. It’s quite easy to sort the various objects to their respective families, but when distinguishing between individual greebles things get tough. The prosopagnosia participants scored the same at distinguishing greebles as the control group, which had no problem in distinguishing faces. The participants however scored much lower than the control when they were asked to recognize faces. In other words, the question whether or not face recognition is an independent brain mechanism or is coupled with other functions is still open, yet the present findings suggest that prosopagnosia is the result of damage to a brain mechanism devoted specifically to face processing. The results were reported in a paper published in the journal Proceedings of the National Academy of Sciences.